Download "Programme Specification: Master of Business Administration"
2 13. Main educational aims of the programme The MBA provides an analytical and integrated study of business and management, which results in an understanding of organisations, how they are managed and the external environment in which they operate. 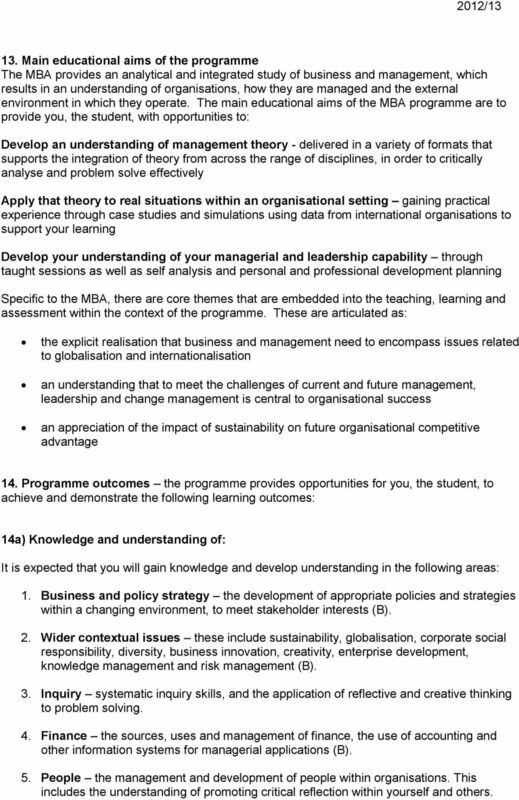 The main educational aims of the MBA programme are to provide you, the student, with opportunities to: Develop an understanding of management theory - delivered in a variety of formats that supports the integration of theory from across the range of disciplines, in order to critically analyse and problem solve effectively Apply that theory to real situations within an organisational setting gaining practical experience through case studies and simulations using data from international organisations to support your learning Develop your understanding of your managerial and leadership capability through taught sessions as well as self analysis and personal and professional development planning Specific to the MBA, there are core themes that are embedded into the teaching, learning and assessment within the context of the programme. These are articulated as: the explicit realisation that business and management need to encompass issues related to globalisation and internationalisation an understanding that to meet the challenges of current and future management, leadership and change management is central to organisational success an appreciation of the impact of sustainability on future organisational competitive advantage 14. Programme outcomes the programme provides opportunities for you, the student, to achieve and demonstrate the following learning outcomes: 14a) Knowledge and understanding of: It is expected that you will gain knowledge and develop understanding in the following areas: 1. Business and policy strategy the development of appropriate policies and strategies within a changing environment, to meet stakeholder interests (B). 2. 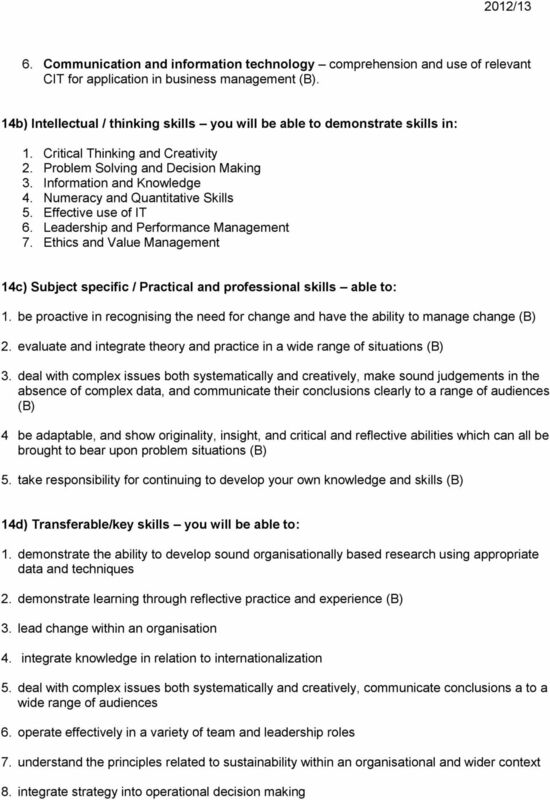 Wider contextual issues these include sustainability, globalisation, corporate social responsibility, diversity, business innovation, creativity, enterprise development, knowledge management and risk management (B). 3. Inquiry systematic inquiry skills, and the application of reflective and creative thinking to problem solving. 4. Finance the sources, uses and management of finance, the use of accounting and other information systems for managerial applications (B).. People the management and development of people within organisations. This includes the understanding of promoting critical reflection within yourself and others. 6 Our MBA programme is designed to be responsive to the changing context of work, management and career development. 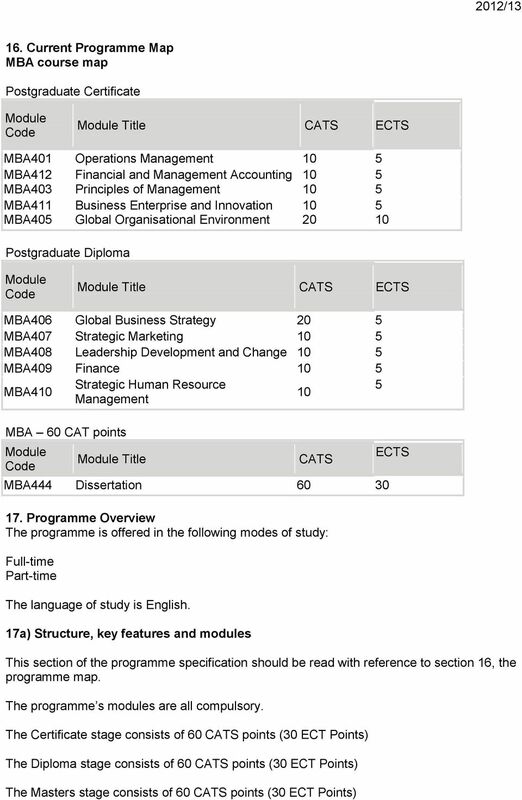 This programme is underpinned by national benchmark requirements for postgraduate business study. The programme is designed to complete the Certificate and Diploma stages prior to the start of the Masters stage. Our full-time and Associate Faculty members have a range of national and international business and research expertise to offer students who study here with us. The size of the cohorts here allows for supportive and flexible learning. The knowledge and skills you will develop from the MBA programme can be applied directly to the workplace. All of the modules undertaken are compulsory and are designed to ensure general management principles underpin learning and assessment strategies. 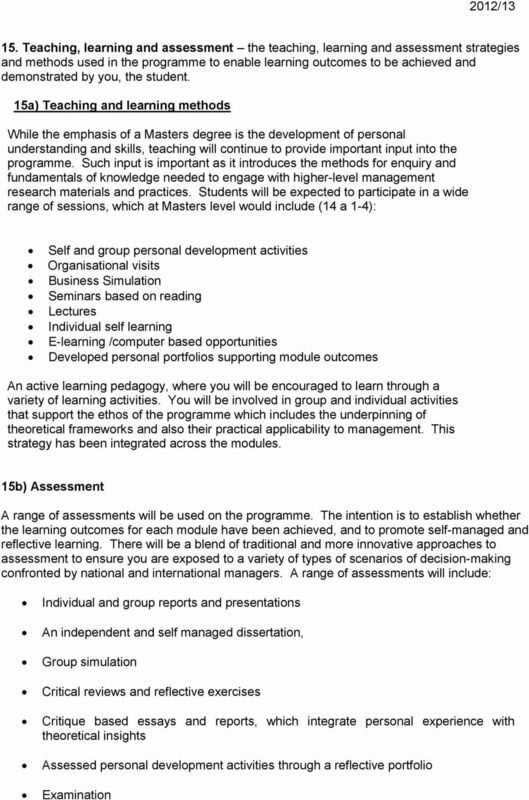 Personal professional development and reflective practice activities are embedded throughout the programme. The programmes have been designed with a personal and professional development (PPD) ethos. All students engage with a range of induction activities, for example intercultural skills training, group work, case study approach and team building. They are also offered study skills sessions, including research methods training, throughout their programme to introduce and/or refresh skills and conventions associated with studying at masters level. International students have access to additional English language support. The dissertation will support the development of research, critical analysis and communication skills. This module will also facilitate a reflective piece that will be included in your final submission. 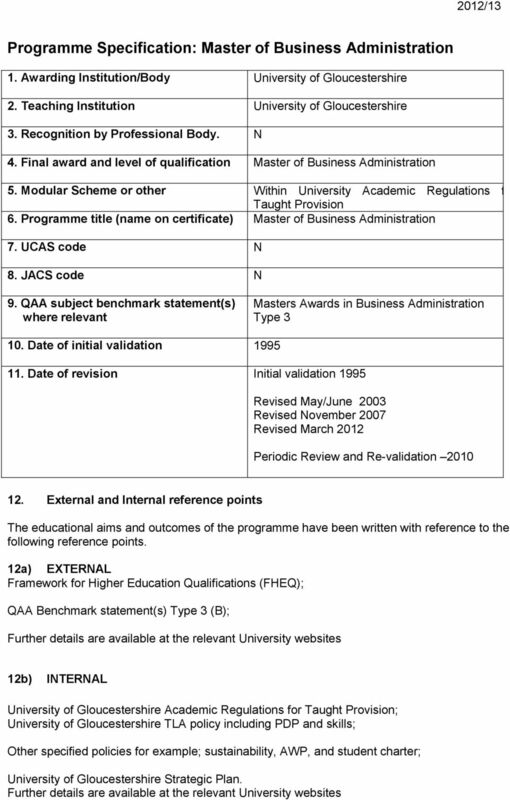 17b) Credit and award requirements For the Postgraduate Certificate in Management students should: Pass 60 module credits (all modules at Postgraduate Certificate Stage) For the Postgraduate Diploma in Business Administration students should: Pass 120 module credits (all modules at Postgraduate Certificate stage and Postgraduate Diploma stage) For the Masters in Business Administration students should: Pass 180 module credits (all modules at Postgraduate Certificate stage, Postgraduate Diploma stage and Masters stage) 18. Additional information Further information on Assessment; Quality Assurance including Evaluation; Disability and Learning support provision; Criteria for Admission/Recruitment and Careers can be found at the University website. The National Recognition Information Centre (NARIC) provides details of comparative information on all Higher Education programmes. 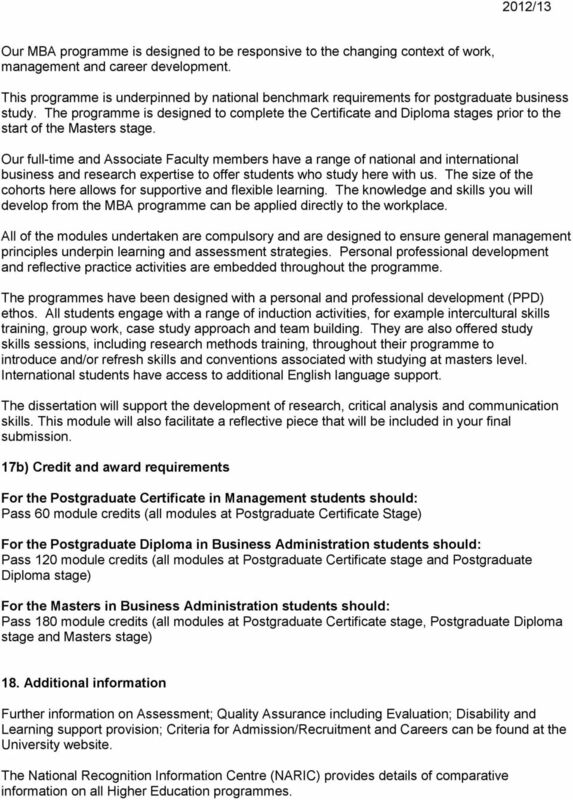 UNIVERSITY OF ULSTER COURSE SPECIFICATION COURSE TITLE: Postgraduate Diploma/MSc in Political Lobbying and Public Affairs 1.